Learn about the Sun & how it generates "weather" in space that affects our planet. Find out how this stormy space weather can produce the magnificent diplays of Northern Lights we often see from Caithness. Learn how detailed imaging of the Sun by telescopes in space is helping scientists better understand how it works. The North Highlands of Scotland generally has low levels of light pollution allowing breathtaking views of the night sky to be enjoyed - learn where some of the better stargazing spots in Caithness are, and what you might be able to see at them. Join CAG for solar observing and night sky observing events using their equipment. 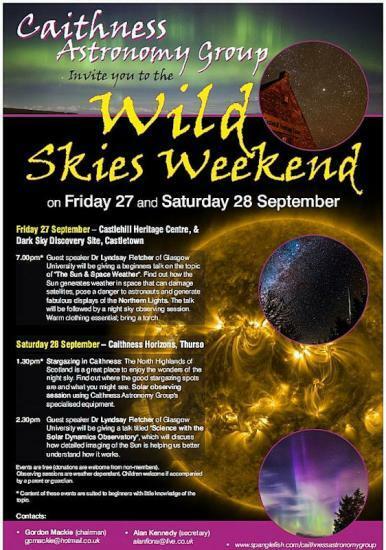 See some great footage at Caithness Horizons on 27th and 28th made by CAG member Maciej Winiarczyk. His short films of the Caithness skies have gone global with mentions on many web sites and appearing as Astornomy photo of the day a few weeks ago.